Love it! You sprinkle a little glitter wherever you go!!! Smiling … thank you for sharing the bemusement of the medical profession. Glitter on! I am friends with a member of the glitterati! Great check-up, Beth. Thank you for this really fun story, Beth, and for reminding us to bridge the gap between adolescent glitter and the glow of maturity. You shine wherever you are Beth. I love this and it makes me want to dance and throw glitter in the air. I feel sorry for men, they don’t really do glitter, and that a fun part of being alive. Too funny! Shortly after moving in with my boyfriend 4 long years ago, I wrapped Christmas gifts in glittery ribbon. To this day, we STILL find glitter. He solemnly refers to it as “the Christmas his man-cave died” hahaha! Glitter NEVER goes away, does it?! This is great – lovely idea. 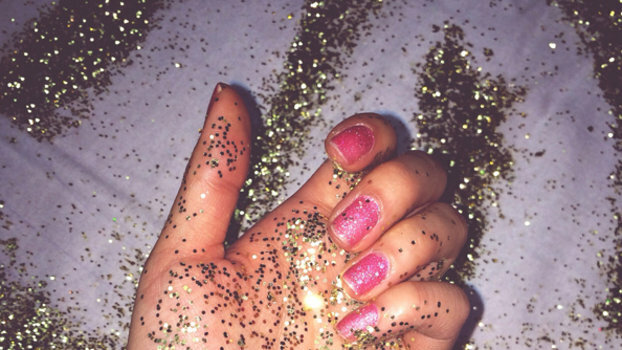 We all need glitter in our lives. just wonderful…and I know a really dirty story shared by an 80 something lady that I cannot reveal for public consumption regarding glitter and a trip to the gynecologist….some day when we meet in a bookstore again? I knew there was something sparkly about you when we met. I’ve spent most of the past two days trying to clean up the glitter from my floors, couch, table, skin, hair. I have a little one who got four different glittery princess dresses for her third birthday…..! Ha! I get like this too stocking our glitter-smothered holiday decorations at work. It gets all over you…. That’s one thing about being a kinder teacher. Life sparkles! The delights of a teacher! My aunt used glitter on certain areas once at a gynocologist appointment just to liven things up. You reminded me immediately of “Glitter and Be Gay” from Candide. The song begins about a minute in at [https://www.youtube.com/watch?v=aVsLMxam21I]. I like sparkly things. I was once at a party when a woman announced publicly that she figured out that her husband was the glitter and she was the glue. I found the comment fascinating.